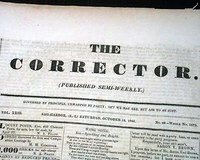 WORCESTER REPUBLICAN, Massachusetts, Aug. 2, 1837 The masthead features an engraving of Thomas Jefferson. 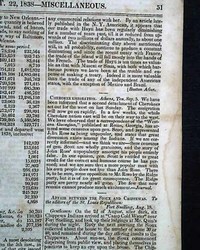 The back page has nearly 2 1/2 columns taken up with "An Act Making Appropriations for the Current Expenses of the Indian Department..." signed in type by the President: Andrew Jackson. 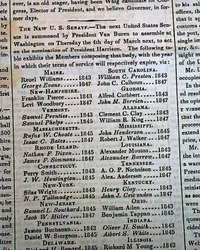 Also "An Act to Change the Titles of Certain Officers in the Navy" (see). 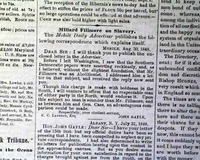 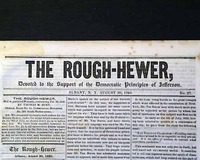 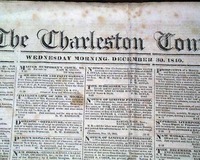 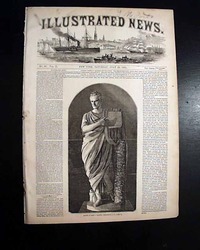 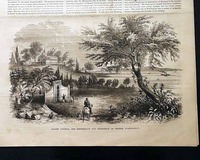 THE ROUGH-HEWER, Albany, New York, August 20, 1840 Has "Devoted to the Support of the Democratic Principles of Jefferson" in the masthead below the title. 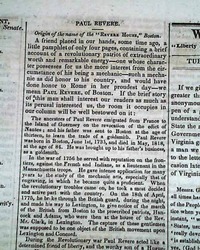 Front page has: "Mr. Van Buren, and the Elective Franchise" which consumes most of this issue. 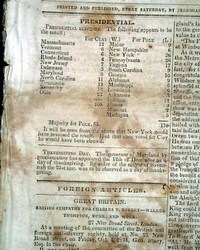 Quarto-size, 8 pages, a few lite margin stains, large stain on an inside page, some foxing. 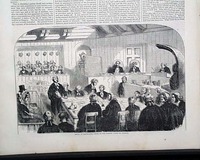 Page 2 has: Great Whig Mass Convention In Old Suffolk Mr. Websters Speech. 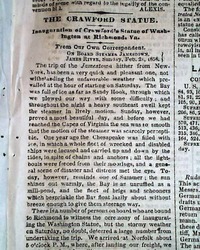 Brief report and then the text of Websters speech at Patchogue, on Long Island. 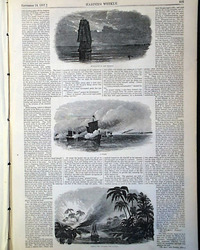 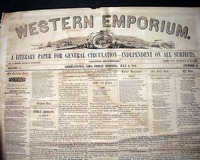 Other news of the day includes: "Destructive Storms" "Another Steamboat Accident" and more. 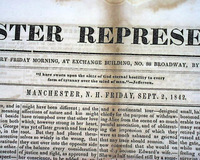 MANCHESTER REPRESENTATIVE, Manchester, N.H., Sept. 2, 1842 On pg. 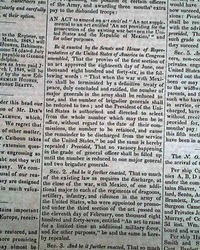 2 under "A Treaty" is the text of the Webster-Ashburton Treaty, signed in type: Ashburton & Daniel Webster. 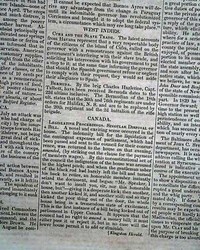 Treaty settled various disputes between the U.S. and Great Britain, including the northeastern boundary with Canada. 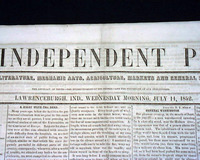 Three areas of lite to moderate foxing, with a bit in the text of the treaty. 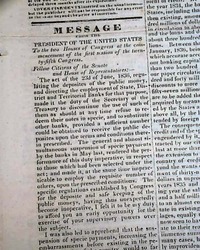 THE UNITED STATES GAZETTE, Philadelphia, Pennsylvania, September 5, 1843 Page 2 has a "For President, Henry Clay, of Kentucky..." advertisement. 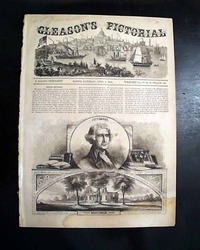 Some news of the day, but mostly ads & notices, many with include small illustrations. 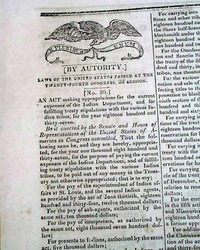 Complete four pages, rejoined at the spine, otherwise in good condition. 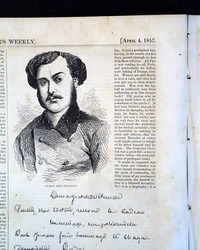 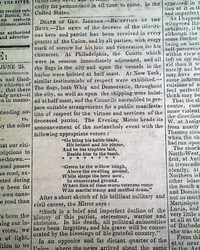 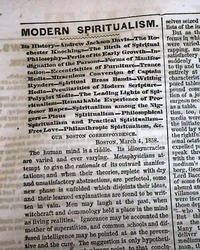 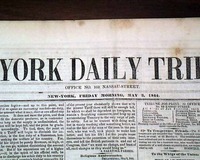 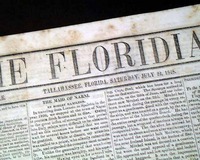 NEW-YORK DAILY TRIBUNE, May 3, 1844 On pg. 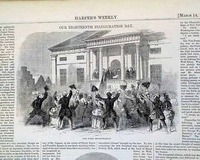 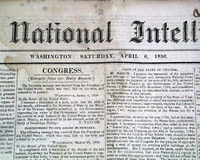 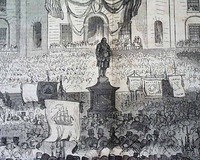 2 under Whig National Convention is a detailed report about the proceedings of the convention, with word that Henry Clay and Theodore Frelinghuysen were nominated. 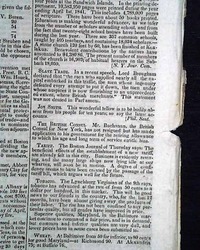 Other news of the day and several advertisements. 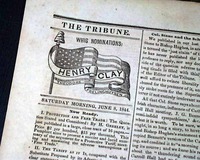 First leaf has a small hole in the upper right corner, otherwise in nice condition..
NEW YORK DAILY TRIBUNE, June 8, 1844 The top of page 2 has a graphic ad supporting Henry Clay as the Whig nomination for President (see). 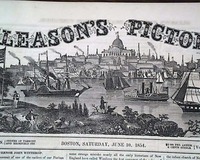 The front page has a curious illustrated ad for a runaway engraver (see). 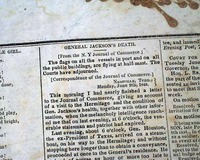 Four pages, slightly irregular at the spine, nice condition. 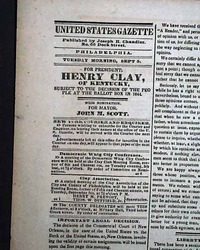 NEW YORK DAILY TRIBUNE, June 10, 1844 The top of page 2 has a graphic ad supporting Henry Clay as the Whig nomination for President (see). 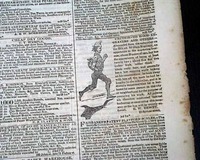 The front page has a curious illustrated ad for a runaway engraver (see). 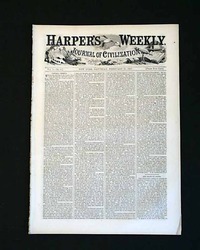 Four pages, slightly irregular at the spine, nice condition. 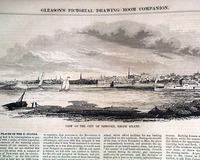 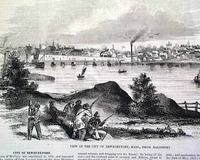 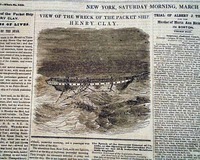 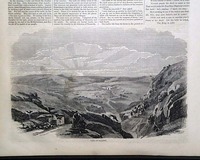 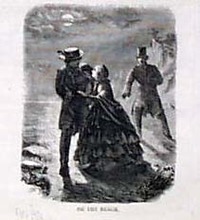 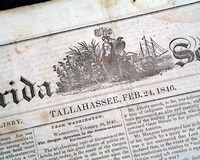 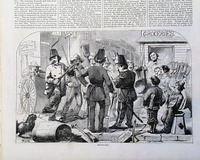 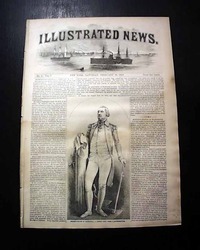 THE NEW YORK HERALD, March 28, 1846 The front page is dominated by an illustration headed: "View Of the Wreck of the Packet Ship Henry Clay" with half of the front page taken up with reports of the wreck. 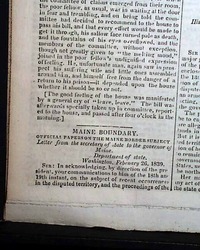 Four pages, never bound nor trimmed, generally nice. 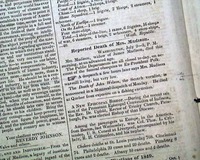 * Death of Dolly Madison ? 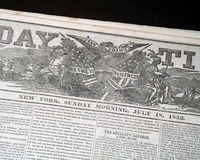 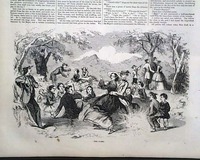 SATURDAY TIMES, New York, July 18, 1852 Page 2 has half a column headed: "Funeral of Henry Clay--His Will--His Family". 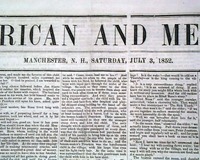 Other news of the day, 4 pages, large folio size, some staining and a few mends.